For the month of October 18 of my abstract paintings are on exhibit at the Streff Gallery located in the Shoen Library at Marylhurst University on Hwy 43 just south of Lake Oswego, Oregon. This is the view from a Streff Gallery window. 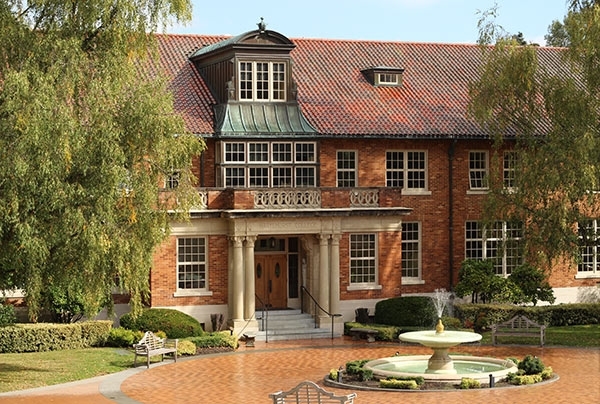 Marylhurst University is where I earned my degree in art. It is one of the most beautifully serene campuses in all of Oregon. I can't really explain it, but it's one of those rare places where you feel totally at peace as you walk around the grounds. Looking out the window again from Streff Gallery you can also see a perfectly lovely view of the bell tower. I'm making a final adjustment on a painting by the window. The theme of this show is titled "I Just Want You to Be Happy" This is what my mother told me many times over the years as I suffered growing pains on my way to becoming the adult version of me. These paintings represent my struggle to find true happiness. Can we really be happy and content with our lives? It's a state of mind, right? For me, I think true happiness is found living and staying grounded in the present moment and that's how I strive to live each day. What about you? Leave a comment,.... did your parents also tell you, "I just want you to be happy."